IDEA: Hovis bread secured its place in British advertising history with 1973's much-loved "Boy on Bike" spot. Directed by Ridley Scott, the homespun tale featured a young boy pushing a bike with its bread-filled basket through a small town. In 2008, Hovis had another huge hit with "Go On Lad," a cinematic, two-minute spot from agency Miles Calcraft Briginshaw Duffy that followed a boy through 122 years of British history, beginning with the brand's 1886 founding. Two more notable spots followed. Now there's another one with the same grand tone—a 90-second spot from Dare in London (which merged with MCBD in 2010) in which a boy accompanies his father to work for the first time on a farm that grows Hovis wheat. It's a product spot—selling a new loaf of bread—and yet, in keeping with Hovis tradition, it's much more. "Unlike 'Go On Lad,' it does carry more of a [product] message," said Danny Hunt, who worked on the ad with creative partner Gavin Torrance (they've both since moved to Saatchi & Saatchi). "The difficult thing when working on Hovis is that each new ad has to carry whatever the message is while also feeling like a brand ad." COPYWRITING: The creatives considered many scripts but were drawn to the classic coming-of-age story. At first, the father seems reluctant to bring his son along. Throughout a day filled with ups and downs, he drives him to exhaustion. At the end, at the dinner table, the mother asks how the boy did. "He did great," the father says, finally breaking into a smile as the son grins proudly. Hunt and Torrance tweaked the script after spending a day on an actual Hovis wheat farm. "They're not the twee, Hobbit-like places we had always imagined," Hunt said. "We also liked the idea that people aren't just buying a loaf of bread, they're buying into British farming. They're buying into this family and the work they put in." The director, Seb Edwards, added a few touches, like the boy finding a frog in a canal. "It's good to work with British farmers," a voiceover says at the end. "New Hovis British Farmers Loaf. Baked with Britain's best wheat." ART DIRECTION: The look is cinematic but gritty and down to earth. "We always measure Hovis work against 'grit and goosebumps.' Does it feel honest? And does it make you feel something? It can be neither schmaltzy nor dour," said executive creative director Danny Brooke-Taylor (who has also since left Dare but has not landed at another shop). The creatives looked to British cinema for tonal references, from David Lean's Great Expectations to Ken Loach's Kes to Stephen Daldry's Billy Elliot—films featuring "spirited characters who don't have it easy but end up triumphant," said Brooke-Taylor. FILMING: The spot was shot on two farms in Lancashire that both grow wheat for Hovis. "Three days of bitterly cold wind and driving rain didn't stop the shoot, because it wouldn't have stopped a farmer," said Brooke-Taylor. TALENT: Stirling McKee, a young Scot, "possessed a fragility that made him perfect to play the young boy," Brooke-Taylor said. 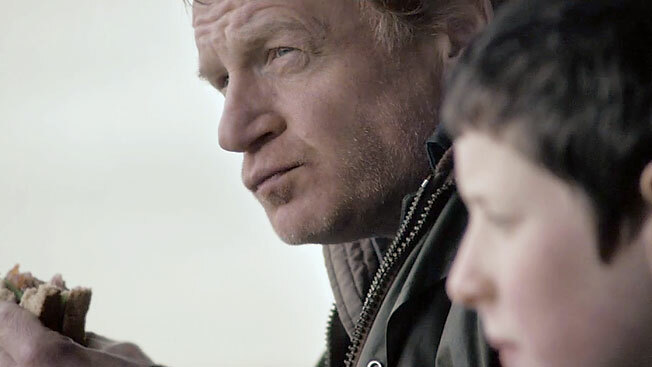 Welsh stage and screen actor Mark Lewis Jones plays the father. SOUND: Rachel Portman, known to the agency for her work on Lynne Ramsay's film Ratcatcher, composed the score, "a piece that would enable the story to build gently, and with restraint, to an ultimately positive resolution," said Brooke-Taylor. Parv Thind at Wave mixed in a bed of atmospheric sounds designed to be subtle and authentic.